Bara några veckor kvar i högsäsong !! Gå ut ur KOLDEN och slappna av !! Parrita, är en en av ett slag skatt som är utanför misshandlad sökvägen den livliga turistområdena. Känn lokal erfarenhet av denna lilla arbetarklassen stad genom att möta människor i många restauranger, butiker, mataffärer, apotek etc. Parrita har allt du behöver. Villa Las Flores är en 24/7 helt säkrad 23 hektar tropiskt paradis inbäddat 2. 5 miles inlandet mellan orörda orörda stränder och Estuary Wildlife Sanctuary. Slappna av och njut av lugnet i apor som spelar i sin egen livsmiljö. Lyssna på tropiska fågelsång och vågorna i havet kraschar från den stora privata poolen. med alla dina planer. Från biluthyrning, zip linjer, forsränning, vilda turer, taxi, 4WD ... you name it. Vår vackra stranden villa har roliga tropiska väggmålningar målade på väggarna av en lokal konstnär. Det stora sovrummet har en stor garderob och hurts för alla dina saker. Fönster på båda sidor för underbara vindar. Kung storlek säng delas upp i två tvillingar om det behövs. Den rymliga avskärmade solrum ser på de inbjudande pool och grönskande marker som trädgårdsmästare brukar dagligen. Helt luftkonditionerade, har vår villa alla bekvämligheter i ett hem. Det ombyggda köket har mikrovågsugn, spis, kakelplattor, handgjorda teakskåp, tvättmaskin och torktumlare, alla rätter och matlagningsprodukter. Sängkläder, handdukar, badlakan, solstolar, kylare, Boogies styrelser, cyklar, hängmatta, TV, DVD-spelare, CD-spelare, radio, väckarklocka och WI FI finns för din njutning. Playa Palo Seco Beach är en 3-4 minuters promenad från vårt hus. Njut cykelturer, lugnande promenader, titta på fiskarna ta in fångsten av dagen. Visa sin orörda skönhet, hisnande solnedgångar. Stanna för en drink eller fullständig måltid på en av de många matställen som finns ner till stranden. Pool och Rancho med två toaletter + utomhusdusch (bara några steg från skärmad Lanai), Gated gemenskapen (24 timmars övervakning). Hope you will keep us in mind for another vacation. This villa was the perfect size for two people and the property is truly a hidden gem! The information on this property does not do it justice. The ocean is a short walk and is pristine, with it’s black sand and beautiful sunsets. Although a public beach, during the week, you could walk for miles and only hear the waves crashing and see birds flying overhead. This is a place to relax and get in touch with nature. The gated community feels safe, is clean and the surrounding nature is breathtaking. From monkeys playing in the trees to scarlet macaws flying above, there is rarely a time when a bird is not singing or a creature is not providing entertainment. The villa is a perfect size with all the amenities, including coolers, boogie boards and beach chairs. The town of Parrita is a short drive away and has a wonderful little bakery, butcher shop and fruit/vegetable stands for all the necessities to eat in. We stayed in this beautiful location for 4 weeks and found the staff extremely helpful, efficient and friendly. If restaurants are a preference, there are plenty to chose from within a reasonable distance. Renting a car makes this more convenient, but bus service and taxis are readily available. There is plenty to explore if you like hiking but for those that like to stick close to home, Villa Las Flores also has a large community pool that is clean and the perfect temperature. There truly is something for every interest. This a beautiful place, away from the mainstream tourists, making it the perfect home away from home. Truly a hidden gem worth visiting!!! Diane, thanks so much for your great review! I should hve had u write the description, you really described how we feel also. It’s so important to us that our guests feel comfortable and relaxed. 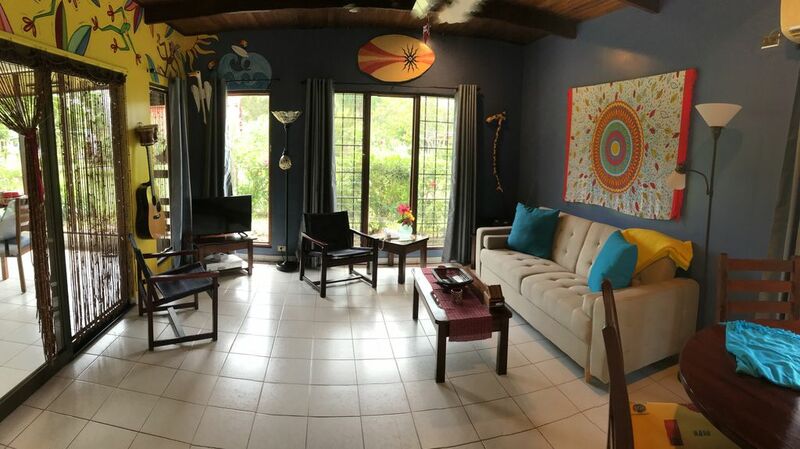 Sue and Roger's place in Parrita was just perfect for the three of us. We were traveling with our daughter who attends a University in Heredia. We headed to the beach and loved our stay at Sue and Roger's place. The people in Parrita, the beach and the property at Villa Las Flores was amazing. We traveled to Manuel Antonio from Parrita for a great day trip, but mostly stayed nearby, it was too nice of a place to leave. My husband and I stayed at this gem and were totally satisfied. The pool is clean, the grounds are immaculate and the condo is comfortable and well stocked. The Palo Seco Beach is in walking distance but we took the car because I like to take anything that I might need. There is a lot of beach and very few people. We tried out two restaurants on the beach the Mar y Sol and the Cocomar, both had great food. We went to Manuel Antonio Park. It was a bit crazy with people and tour guides but we had a great time and we were able to snorkel. The Rainmaker was also wonderful. We were alone the entire hike and saw poison dart frogs, blue morpho butterflies, waterfalls, hanging bridges, tree platforms all in the Lord's beautiful rain forest. Hi Lisa, thank you so much for taking the time to write a review. We always love to hear from others all the wonders they experienced while in and around our sweet home. We fell in love with it 11 years ago. Hope u keep us in mind for future trips. What a dream come true! Enjoy life for a day or week. We were there for a week. Had a great and wonderful time. Honeymoon. One of the best beaches I've found in the world! I have stayed at Villa Las Floras with friends and then this 2nd recent visit was with my husband. Best beach ever! I can honestly say it was the most relaxing 2 weeks. During the "Friends" visit we went Zip lining & to dinner often. Parrita is a gem! There is a great bakery, butcher, fish, liquor store, and pharmacy's. ( I needed to deal with bug bite's don't go out at night without using spray.) There is also a great fruit and vegy truck and store front right off the main street in the middle of Parrita. All of the merchants want to help so do not be affraid to check out the local shops. But our days at Villa Las Floras will never be forgotten. We started with a long walk on the beach, it is hard to sleep past 6:30 because there is so much bird action. The first visit in September the monkey's came to the trees between the river bridge and the villa each morning at 6 - 7 am. The January visit they came between 8-9:30 am. After a beach walk we'd return to the pool shower and go for a dip. Return to the villa make breakfast and then head to the beach. We'd spend hours boogie boarding, reading books, playing in the sand, watching the surfers & fisherman. Then we'd head to Las Palmas for lunch. It is walking distance to the beach but we were always in the car because we' have boogie boards, floaties, beach mats, coolers with water and beer. So we often drove from the villa to the beach and then to lunch. Las Palmas is new and fantastic!! The fish soup is like none I've ever had. The ceveche was fabo, the grilled shrimp and chicken and rice was a daily staple, but when we were really hungry we'd order "The entire fish!" After lunch we'd head home, read around the pool, check email's, hang out in the clubhouse, english and french are spoken here. We'd play cards, shuffle board, horse shoes, darts, and swap stories of the newest and best places to eat. There is a turtle pond in the villa. Show up there anytime of day to watch the turtles interaction. Many herons live there, we saw a woodpecker and many different bird varieties. Amazing. My husband and I did a bunch of driving around for 3 days to Arienal, Manuel Antonio, Puntereas, Quepos, Jaco, Montezuma, & other towns. When we returned to Villa Las Flores we were glad we had a few more days to soak in Costa Rica!! There were 2 really cool rain storms. Besides being fully equipped at the house, there is an on-site manager who will help you with booking trips. Sue and Roger have made a very comfortable home!! Omedelbart Intill villor (4 km söder) är en omfattande Mangrove mynning, Manuel Antonio National Park 15 mil söder om Villas Erbjuder Jungle Vandringsleder + Vackra skyddade stränder och snorkling, är Jaco Beach 25 Miles i norr ett populärt turistmål för costarikaner och är en surfarparadis, Quepos: en stad belägen 15 mil söder om Villas Las Flores erbjuder världsklass djuphavsfiske, Marriott Hotel 30 mil norr om Villas Las Flores har en vacker 18-håls golfbana, ridning är tillgängligt 1 mil söder om Villas Flera företag erbjuder Forsränning Resor på närheten Parrita floden.